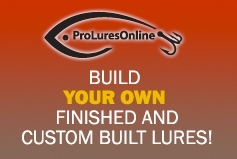 If you are a lure maker and have searched for a nice box for your lures you know they are almost impossible to find. I have spent many hours on internet searches or making telephone calls looking for boxes just the right size for the lures that I make. I eventually found a source for the box sizes that I need the most. I have two box sizes that pretty much fits most of my lure size needs. They are 2 x 2 x 6 and 2.5 x 1.50 x 5. This is width x depth x length and these are outside dimensions of the boxes. These are two piece boxes with a top and bottom. They have finger slots on the lid piece to facilitate ease of opening. These boxes are white inside and out. They have a matte finish on the inside and a smooth satin finish on the outside of the box. The box material is what is known as a high quality paper stock with a thickness of .023. These boxes come flat and are not glued together. There are two methods I have used to glue them together. First is a hot glue gun and secondly with a glue tape dispenser. The glue tape dispenser is a little more costly to get set up but is by far the best way to glue boxes particularly if you are doing a lot of boxes.